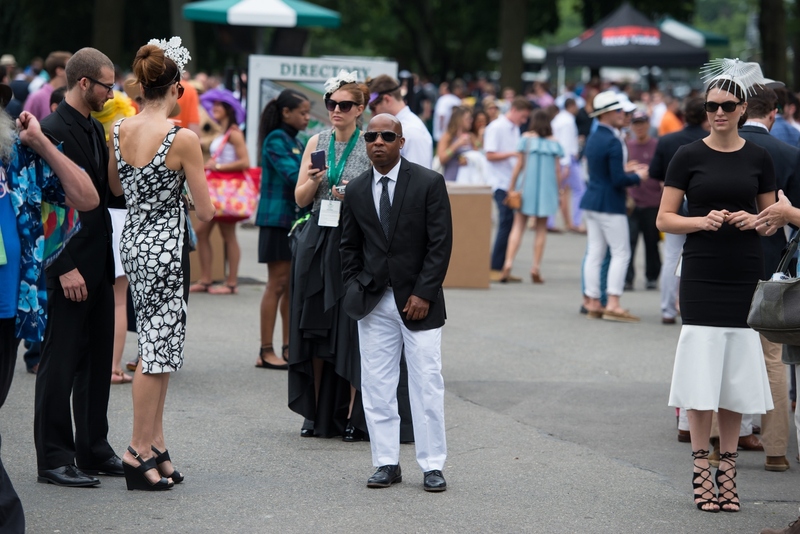 We promote Triple Crown Trends not only to give each race day its own category but also to make styling fun. I love each of thre three Triple Crown races and their different styles. Hard to pick a favorite but I can say that the Belmont Stakes might be up there. I have a tendency to always wear the color (or non-color) black. I am comfortable in it and it also gives me an extra dose of confidence because I feel I look best in black! As many of you know, the color black slims you which is why the LBD, or Little Black Dress, has become well known and is a go-to for many ladies out there. So when I was looking for my monochrome fashion for the Belmont, this dress came across my scrolling fingers on the internet and I KNEW it was the one I wanted to wear. When I traveled to Hong Kong for their Longines International Races, I made myself familiar with a few of the local brands and designers. One of which is the talented Sarah Lai. I wore one of her designs for the raceday there and have ever since kept up with her new collections. This gorgeous Lydia dress came out just a few weeks ago and I knew I had to have it! In the world of curvy women, I wouldn’t be considered one (yes I am jealous of you!) but this dress hugged the body just right and gave me a ‘sense’ of curves. The flare of the white fabric gave the dress a sense of movement and sass. When I saw it, I think it screamed sophistication and elegance….what do you think?? Side note: Ladies, I have heard people say before “you are so skinny! I wish I had your body!” Or “Everything looks good on you! I could never wear that!” … the truth is not everything looks good on me just as not everything looks good on you! We all have our own body types and need to find the dress that makes us feel comfortable and confident! Also, I LOVE food….like LOVE FOOOOOD. I eat…a lot …sometimes too much and I will never stop eating good food (NEVER). I will, however, work-out more if I need to! I am very happy with my body regardless if sometimes I feel I should put the burger down and hop on the treadmill. I take care of myself and just want to have fun in life with food, drink, racing, clothing, friends, family etc. Find your happy place with your body, your fashion, and yourself! Don’t be jealous of other people to the point of wishing you were them, they all have the same insecurities as you do! The grass may look greener on the otherside, but it still needs to be cared for just like yours…maybe they just water it more! Grab the hose and get happy! 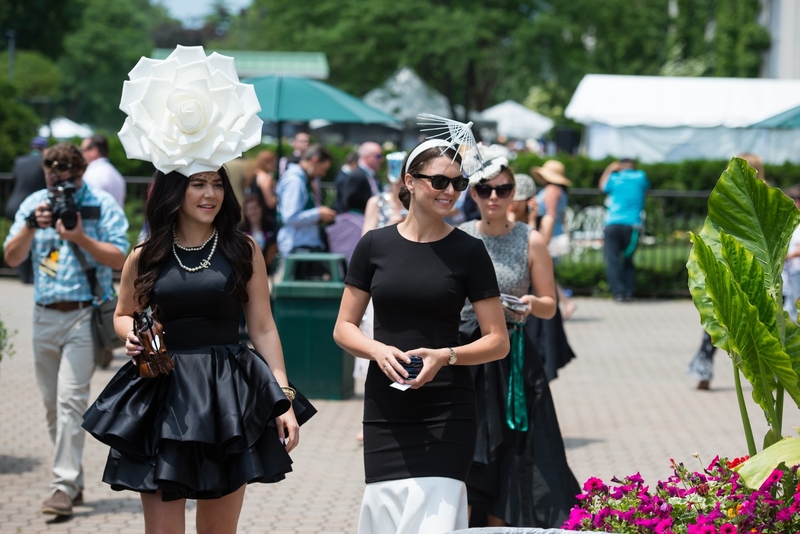 Finding millinery for the Belmont Stakes is always fun and sometimes a bit challenging. 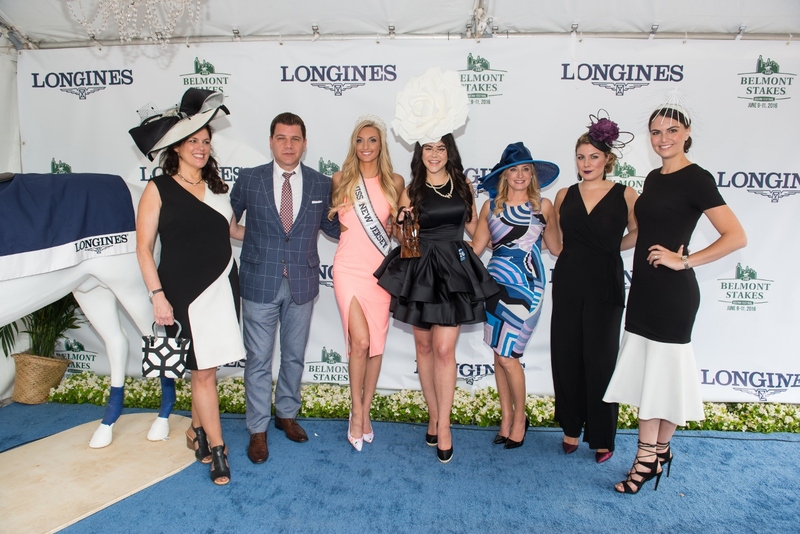 Due to the proximity of ‘The Fashion Capital of the World,” I always want to go a bit fashion forward but still need to keep it elegant for the Longines Fashion Contest. After meeting a new friend of mine, Leckie Roberts from West Village Wasp, I was connected with Heidi Lee who constructs 3-D printing hats! 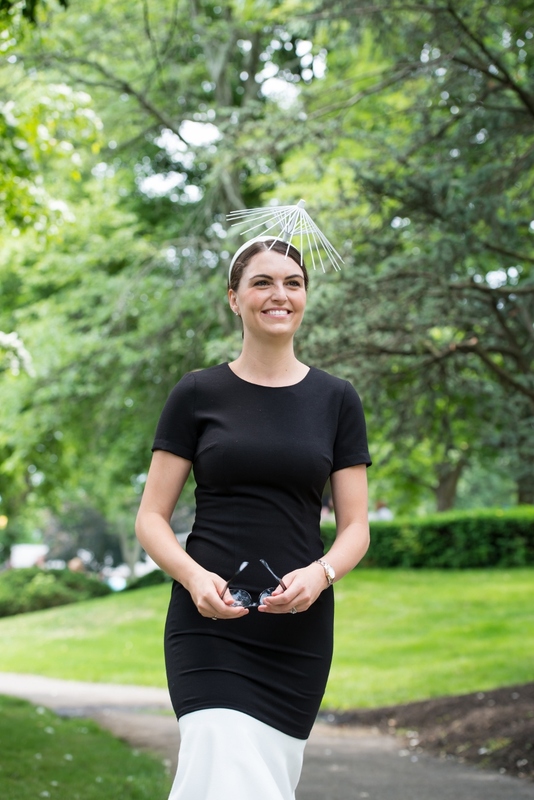 I tried on a few of her pieces and chose her Cocktail Parasol Hat in white to compliment my dress’s flare. 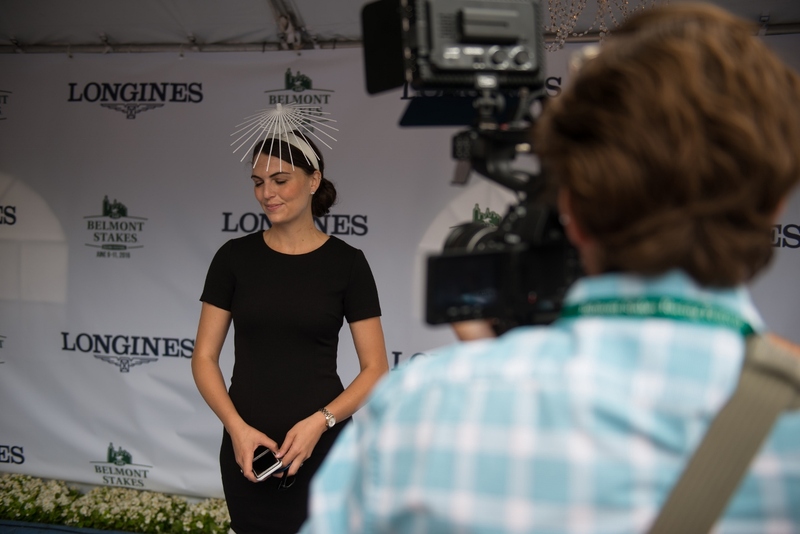 Best thing about wearing this hat on the day: Prior to the fashion contest it was VERY windy on track and when usually I am holding on to my hat, this one never moved out of place. I paired the elegant Sarah Lai dress with my Steve Madden lace up sandals (more than 50% off!). I prepared for the long day of racing by adding in Dr. Scholl’s inserts for some extra padding. I broke one of my rules by wearing these shoes. I wore these the day before in Soho for photo shoots and a get together at Nicole Miller…but we survived! No blisters or bruises! Thanks Steve! Love meeting other Fashion at the Races ladies! Greenery at Belmont Park is one of my favorite parts of the track! My $1 sunglasses in hand…can’t seem to lose these ones! I paired the Sarah Lai dress with my Steve Madden lace ups which I also added my trusty Dr. Scholl’s inserts for extra padding. I knew it was going to be a long day on the track and preparation is key!